Regular readers of my blog will perhaps be aware of my previous trips to Letters Live events over the last five years and last night I was back for another evening, appreciating the brilliance of the written word, this time back at Union Chapel in North London. For those unfamiliar with the events, they are such a simple, yet beautiful concept. A selection of letters, some from decades ago, others from today, are read aloud by a group of actors and performers. You don’t know what letters you’ll hear, nor who will read them. Despite its huge rise in popularity, I still love that the creative team behind Letters Live don’t reveal who the performers are beforehand. The night is, after all, about the magic of the letters, letter writing and the emotions they convey. It’s not meant to be about the famous stars reading them. As I have done following my previous trips to Letters Live, I thought I’d talk a bit about last night’s show and set out a full list of readers and their letters (although, as Letters Live still don’t give you a list of the letters, or it seems tweet them anymore, I’ve had to rely on my notes and some online research once I arrived home to fill in the details). Saturday night’s show included a mix of poignant and humorous letters, giving us an insight in to the lives of their writers across the decades. Taking to the stage over the course of the evening were Benedict Cumberbatch (who has been involved with Letters Live since the very beginning), Juliet Stevenson, Noel Fielding, Katherine Ryan, Thom Yorke, Lesley Manville, Jordan Stephens, Fatima Bhutto, Niamh McGrady and Denise Gough, with musical interludes by the superb Tom Odell (who also read a letter too). Every time I go to Letters Live, there are some letters that move me a little more than others and my personal highlights this time included Denise Gough’s moving reading of Patton Halliday Quinn’s letter to her unborn daughter, which is actually a letter to all young women, from one generation to the next, Juliet Stevenson’s remarkably accurate channelling of Margaret Thatcher and Kurt Vonnegut’s letter to the world in 2088 (100 years in the future for him) (read by Benedict Cumberbatch), in which some of his concerns about our planet remain frighteningly relevant. The event also always manages to include some truly funny moments and the funniest by far for me were Benedict Cumberbatch’s hilarious reading of Fred Allen’s letter to his insurance company, detailing a hilarious series of unfortunate accidents and Lesley Manville and Denise Gough reading both the letter to a Dublin agony aunt column and the response. They proved once again that putting things down in writing often preserves some truly wonderful gems of the past. As well as the letters, these events also always include music too. In the past I’ve seen Rag N Bone Man, before he became the huge name he is and last night I was thrilled to once again see Tom Odell at Letters Live. He’s always superb live and it was no different this Saturday, with him performing three songs, including perhaps his best known one, Another Love, although I also loved his rendition of Nick Cave & the Bad Seeds’s Love Letter. My one slight gripe about Saturday’s event was that there were moments when the fact we were all there for the letters seemed to be forgotten by certain performers. Don’t get me wrong, I’m all for comedy and adding fun in to the night, but in my view, you can do this without making it about you and there were times when Noel Fielding (and to a lesser extent, Katherine Ryan), seemed to forget this wasn’t one of his shows, repeatedly stopping mid-way through reading the letters to make a quip or give his own commentary on it to the audience. For me, it became rather tiring and took away from the letters that we were there to hear and appreciate. It’s the first time I’ve found myself thinking this whilst at Letters Live. However, that aside, it was another enjoyable evening and I still cannot recommend these events enough. There is something for everyone and you will travel through history and emotion as you listen to words that were written, some so long ago, but which meant so much to both writer and receiver. As happens every time I leave Letters Live, it inspires me to put pen to paper and get in touch with someone the old fashioned way and as I’ve done in previous reviews, I’ll end by encouraging everyone to do the same. You may never know how much a letter will mean to the person who receives it. Letter written and read by two young activists regarding the danger of global warning (introduced by Benedict Cumberbatch & read by the two young women who wrote it, Anna Taylor & Ivi Hohmann). This is linked to the planned walkout next week by students across the world to protest about this vital issue, that affect us all. After such an enjoyable night on Sunday (review here), tonight saw me back at the Freemason’s Hall for the final show of this run of Letters Live. It was certainly a brilliant night, with so many more varied letters. Some were incredibly funny and some were deeply poignant, each delivered by another set of talented actors and writers, together with two more musicians/singers who I’d not come across before. Tonight’s performers were: Benedict Cumberbatch, his father Timothy Carlton, Jude Law, Matt Berry, Rory Bremner, Nick Moran, Edna O’Brian, Tuppence Middleton, Mariella Frostrup, Juliet Stevenson and Hassan (a Syrian refugee), with musical interludes from the brilliant singer Rag N Bone Man and Mercury Prize 2015 winner, singer/pianist Benjamin Clementine. What were my favourites tonight? It’s hard actually as there were quite a few to choose from. Timothy Carlton covered all aspects of the emotional spectrum through his readings of a letter between producers of Monty Python’s Holy Grail containing some colourful language and then a deeply powerful letter written by the Argentine poet Juan Gelman in a newspaper to his grandchild, who he had never met and was trying to find (they met 5 years later). Timothy himself seemed moved by it too. Then there was the powerful letter to the people of Europe from a refugee, read out by an English teacher and fellow Syrian refugee, which certainly seemed to move the audience this evening. Jude Law was fantastic , particularly his reading of the letter from the American NASA astronaut in space during 9/11, in which he conveyed his feelings about the world and what was happening as he looked down from above the Earth. Tuppence Middleton read a letter from Lili Elbe, which after recently watching The Danish Girl resonated with me. More laughs came via Juliet Stevenson’s reading of a letter from a 97 year-old lady in a nursing home and Matt Berry and Benedict Cumberbatch took on the Mehmed IV exchange with the Zaparozhian Cossacks, with Matt clearly enjoying the insults he got to read out. Then there was Benedict’s superb delivery of Sol Lewitt’s 1965 letter to Eva Hesse “DO” which required him to read a breathless list of fast paced thoughts, which he did with incredible depth and character. The writer seemed to come alive and leap from the page. Indeed, on pausing for breath after the first part he deservedly received a round of applause! Top marks to both Benedict and Jude Law too who made a conscious effort to address every side of the room, including those sitting behind them. I was also impressed with tonight’s singers Rag N Bone Man and Benjamin Clementine, the latter also playing the piano. I was particularly drawn to the incredible voice of Rag N Bone Man and will certainly be looking in to his music. It’s wonderful that Letters Live has perhaps brought lesser known artists to a wider audience through these shows. As I did before, below is a full list of tonight’s letters and music. “[Bothering Heights]” performed by Benjamin Clementine (song / piano) – I am not sure of the title of this song but am hoping someone can confirm it for me. It was something along these lines anyway! So that’s all from Letters Live for now. At least it’s clear that these events will always return. Their popularity only seems to grow and I look forward to lots more evenings like this one to come. For news and information visit Letters Live’s website, or for more lovely letters visit the Letters of Note website. The brilliant books that have inspired these events: Letters of Note, More Letters of Note, To The Letter and My Dear Bessie are available through the usual stockists. Almost a year since my last visit I was back at the Freemason’s Hall in Covent Garden tonight for another wonderful evening at Letters Live. It’s brilliant how successful this idea has become since it started and it’s such a simple, yet beautiful concept. Hearing letters, conveying such a range of emotions read aloud never fails to make me want to put pen to paper and send some thoughts out to the people in my life. This year at Letters Live, the campaign to encourage more of us to connect via a letter has been stepped up. Rhodia, a notebook company, was on hand giving out free notebooks and postcards. Their promise – write a postcard and post it in the box and they will cover the postage, no matter how far it’s going. Then there’s the Letters Live programme itself, which as well as containing some lovely letters, includes a pull out letter/envelope for you to write to your hero. I’ve already booked to go again on Tuesday, but I thought I’d do as I did last year and talk a bit about each night and set out a full list of readers and their letters (seeing as this is still not contained within the programme, although is tweeted by @letterslive). Tonight’s show included a mix of poignant and humorous letters, giving us an insight in to the lives of their writers across the decades. A few hours before the show it was announced that Benedict Cumberbatch (who has been involved with Letters Live since its beginning) would be taking part tonight, which was an added bonus! Taking the stage alongside Benedict tonight was: Louise Brealey, Sophie Hunter, Oscar Isaac, Jeremy Paxman, Geoffrey Palmer, Sarah Snook, Simon McBurney, Hanif Kureishi and David Nicholls, with musical interludes by Nitin Sawhney and Emiliana Torrini. There are always letters that touch me a little more than others at each Letters Live and tonight those I found most special included Oscar Isaac’s moving reading of Richard Feynman’s love letter to his late wife, Benedict’s final reading of Robert Falcon Scott’s letter to his wife as he neared death in 1912 following his team’s successful journey to the South Pole, from which he would never return and Helen Keller’s letter to the NY Symphony Orchestra. Being blind and deaf, her ability to feel the vibrations of their Beethoven concert was wonderfully read by Sophie Hunter. Then there was the letter from the Connell family in Lockerbie to the family of Frank Cialla, a victim of the plane disaster, who they found in their garden. There was of course humour and laughter tonight too. Oscar Isaac was the perfect choice to read Alec Guinness’s letter in which he criticises Star Wars and moans about the young actors treating him as if he were 106! Geoffrey Palmer (as he did last year) read Evelyn Waugh’s wonderfully funny letter to his wife about an exploding tree, as well as Dalton Trumbo’s scathing complaint to a hospital. Then of course there was the wonderful pairing of Louise Brealey & Benedict reading more from Chris & Bessie (who have become a signature for Letters Live in my view). I hadn’t heard of either of tonight’s musical performers but both Nitin Sawhney and Emiliana Torrini added an extra element to the show. All in all it was a fantastic evening. I still cannot recommend these events enough. There is something for everyone and you will be transported through history and emotion as you listen to words that were written so long ago, but meant so much to both writer and receiver. As Canongate CEO said at the start of the night, the words in such letters show us our shared humanity. In years to come I hope there will still be letters such as these for future generations to cherish. So – if there is someone you’ve been meaning to get in touch with – delete that short text or tweet and pick up a pen and a piece of paper. Write to them. You never know it might just make their day. Letters Live has two performances left on Monday and Tuesday. For ticket availability see the website here. The wonderful books, To The Letter, Letters of Note, More Letters of Note and My Dear Bessie are available through the usual stockists. My Top Television Choices for 2016! After looking back at my television highlights of 2015, it’s time to look at what television treats we can expect in 2016. There are exciting dramas returning to the screen, as well as some new offerings which I’m curious to try. So, here are my top choices of programmes to tune in to this year. As I’m in the UK, this list refers to dates and channels on which the shows will be aired here (if known). Anyone who knows me will have expected nothing else to be top of my teleevision choices list for 2016! The X-Files was my first addiction and would probably still be my category if I were ever to go on Mastermind. Therefore, it’s fantastic that it is returning to our screens, albeit for only six episodes. With David Duchovny and Gillian Anderson back in such iconic roles, Chris Carter back at the helm and stories also from Glen Morgan, James Wong and Darin Morgan, this is already very promising. I sincrely hope this delivers for all the fans, but also pulls some new viewers in too. Remember, The Truth is Still Out There! 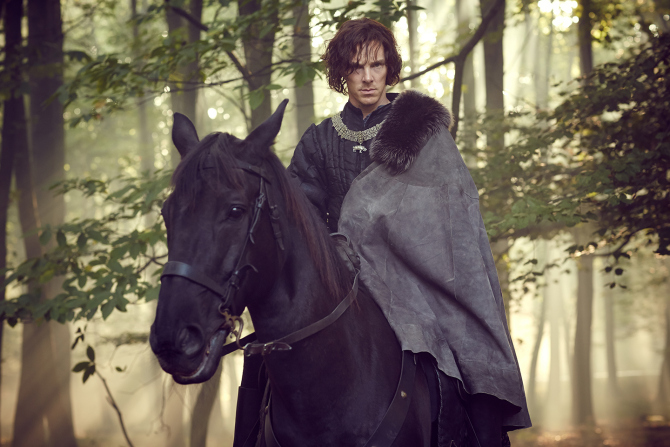 In the hope this would air in 2015, this was also on last year’s list, but we can expect the second series of the BBC’s Hollow Crown some time in the next few months. Entitled The Wars of the Roses, this captures Henry VI and Richard III, with some of Britain’s brightest acting talent involved. Alongside Benedict Cumberbatch as Richard, there’s Dame Judi Dench, Sophie Okenedo, Andrew Scott, Tom Sturridge and Michael Gambon to name but a few. If the quality is as high as the first series (recommended if you missed it), then we are in for a treat. I came late to Happy Valley in 2014, but it impressed me almost immediately, with Sarah Lancashire playing such a strong and complicated character as Catherine Cawood. After the traumatic events of the first series, it will be interesting to see what writer Sally Wainwright has in mind for her next. I’m sure it will prove to be just as exciting and engaging as before and especially when the teaser trailer just released includes James Norton as the awful Tommy Lee Royce! 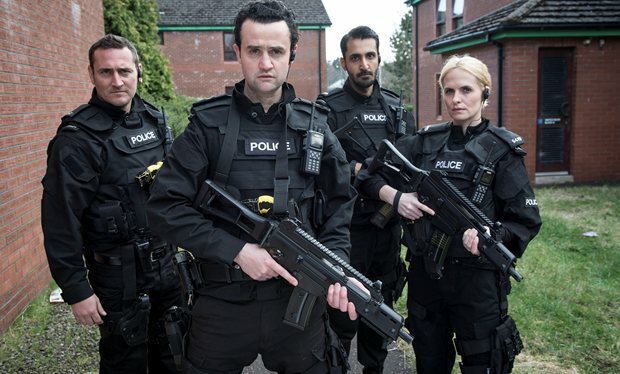 Line of Duty quickly became a success (with help from social media fuelling interest) and with two strong series, both with separate stories, the possibilities are endless of Jed Mercurio’s drama. After focussing on Lennie James’s Tony Gates in series one and Keeley Hawes’s superb multi-faceted performance as Lindsay Denton in series two, the bar has been set very high for the next instalment. With Vicky McClure and Martin Compton being joined by Daniel Mays and Will Mellor, I’m already very excited to see this and will be going to a BAFTA preview screening of episode one on 8th February, so we can expect this some time in the near future. 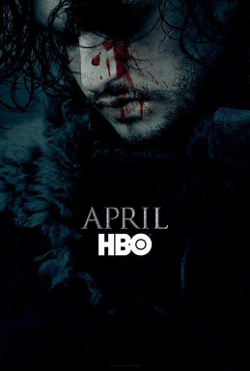 Although the last series was a bit of a mixed bag (but made up for with Hardhome! ), I’ll always look forward to my return to Westeros. Now that we are in uncharted territory, with the majority of characters past book positions, anything could happen in series six and in a show where no one is safe, that is very exciting indeed. Filming photos suggest there will be some wonderful sequences in the new series and I’m looking forward to finally moving forward with the story (seeing as who knows when we’ll get book six from Mr Martin)! 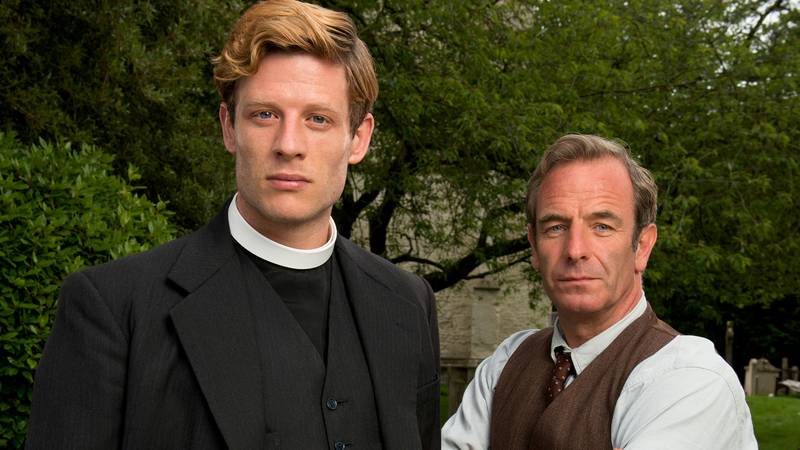 James Norton will be back on our screens again for the second series of Grantchester, in which he plays the lovely vicar, turned detective Sydney Chambers, in stories based on the novels by James Runcie (the opposite end of the spectrum to his character in Happy Valley thank goodness). This was a lovely drama when it aired in 2014, with some interesting charcater relationships and a great partnership in James Norton and Robson Green. Anyone mourning the end of Lewis can take comfort in this series as a worthy replacement. I admit to being a person who prefers dramas to comedies, on both film and television, but after two friends raved about this Netflix series last year, curiosity got the better of me and I’m so pleased that it did. 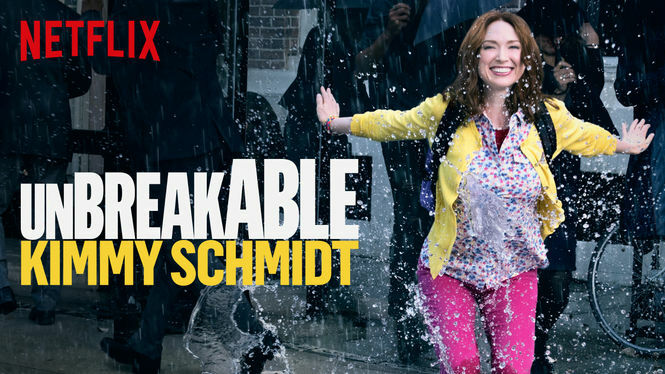 You cannot fail to warm to the ever optimistic, innocently naive Kimmy Schmidt, as she adjust to life in the real world after 15 years spent in an underground bunker. The scripts are witty and sharp, the characters are fun (who doesn’t love Tituss Burgess’s loveable Titus Andromedon!) and the acting is very good indeed. If you haven’t been tempted yet, give it a go – I guarantee you’ll be humming the theme tune all day. “Two houses, two courts, one Crown.” The first trailer for this upcoming, ambitious new Netflix series has just been released (see above) and it looks very promising. The Crown will chart the two key istitutions of Britain – the monarchy and the government, from the 1950s onwards. Written by Stephen Daldry (writer of the acclaimed play The Audience), with a huge £100 million budget and starring some excellent actors, particularly Claire Foy as the young Elizabeth II (last seen playing Anne Boleyn in Wolf Hall), Matt Smith as Prince Philip, Alex Jennings as Prince Edward, Vanessa Kirby as Princess Margaret and John Lithgow as Churchill, this could be a historical drama to rival the BBC if the quality is there. Staying on the historical theme, ITV will later this year be casting a light on the young Queen Victoria in their new eight part drama series. Fresh from her time on Doctor Who, Jenna Coleman is the young Victoria, as the series charts her life from accession at 18, through to her marriage to Prince Albert. It has a fantastic cast including Tom Hughes (as Prince Albert), Rufus Sewell, Peter Firth, Eve Myles and Nigel Lindsay. I still really only know about Queen Victoria’s later life and reign and therefore I’m looking forward to seeing a new aspect of her story. Everyone loves Frank Underwood right? Or is too scared not to?! 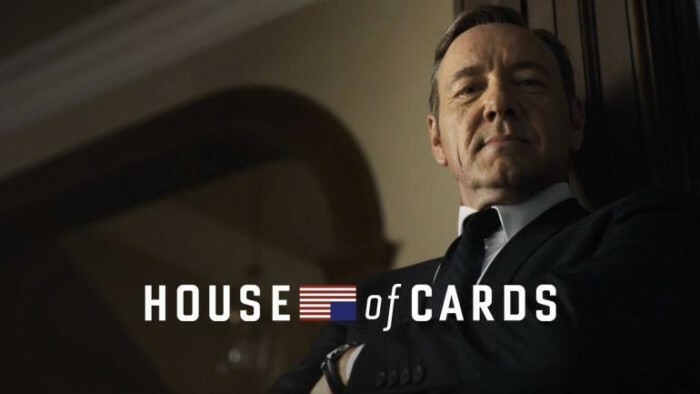 In the series which undoubtedly helped Netflix become the success it is now, Kevin Spacey has become so iconic in this role and his partnership with Robyn Wright is always glorious to watch. Now occupying the Oval Office, it will be interesting exactly what lies in store for them in the next series. 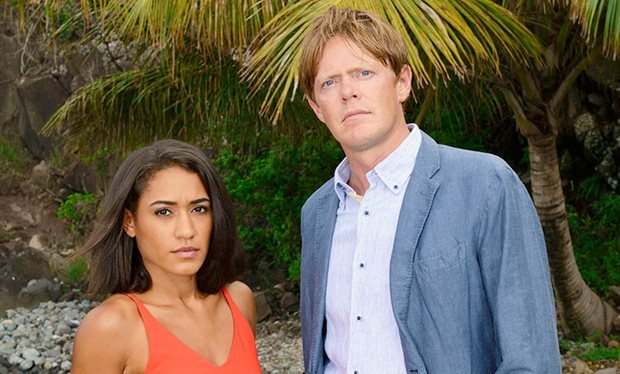 Another heart-warming and fun series that blows away the winter blues is Death In Paradise, which returned this week. I didn’t see the first two series, but as a fan of the lovely Kris Marshall, I’ve thoroughly enjoyed watching Humphrey settle in to island life. How can anyone not love him?! It’s fun, entertaining and is Sherlock Holmes on a tropical island, as Humphrey seemingly solves murders using clues that no one else can see. Yes, your parents may watch it, but so what? This is a brilliant winter tonic! Coming soon in 2016 is this six-part adaptation of John Le Carre’s novel, in which a former British soldier (Tom Hiddleston) is recruited by intelligence agent Burr (Olivia Colman) to infiltrate the arms trade being run by Richard Onslow Roper (Hugh Laurie). I haven’t read the book, but I love a good spy thriller and with such a strong British cast I have high hopes for this series. As a fan of the BBC’s legal drama Silk, it’s wonderful that its creator Peter Moffat has a new series coming this year. Sophie Okenedo leads the show as the first black Director of Public Prosecutions, who discovers her husband (Adrian Lester) has been lying to her for years. I’m intrigued enough to tune in! In the Pipeline / Awaiting a UK network….. I always enjoyed Prison Break, although admittedly the first series was certainly the best. News that it is the next show to be revived is a bit of a surprise, but I’ll tune in to see what direction the story takes next. I believe it will be set as though the finale (in which we said farewell to one character for good) didn’t occur. 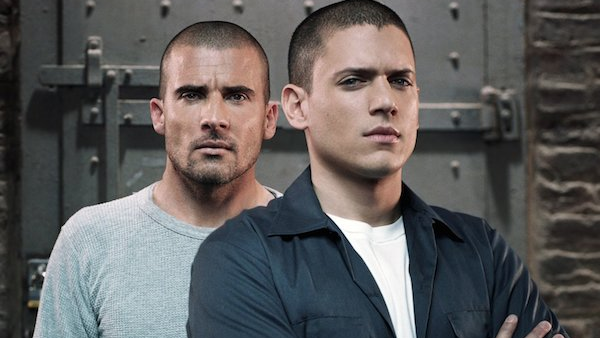 After watching them act together in The Flash it’ll be great to see Wentworth Miller and Dominic Purcell back in the roles they are most famous for. I imagine the makers of this new biblical series are hoping it’ll attract the same audience as Game of Thrones. Its success will depend on whether it’s decent and can attract an audience fast enough. The pilot has already been partly recast and reshot, but the trailer looks promising. With established actors including Ray Winstone (as Saul, King of Israel) and Nathaniel Parker, hopefully the acting quality will be strong. For me though the biggest attraction is its young, male lead, playing David (as in David vs. Goliath, future King of Israel) Oliver Rix. He was Aumerle to David Tennant’s Richard II in 2013 for the RSC and proved what a fantatstic actor he is. I hope this does well (but doesn’t keep Oli away from the stage for too long)! Damian Lewis is back on television is this new US series, playing hedge fund king Bobby “Axe” Axelrod, who is trying to be brought down by US Attorney Chuck Rhoades (played by Paul Giamatti). Having just started in the US on Showtime, I’ll be keeping an eye how this series is received. Given the pull of the two stars, if it is successful hopefully it’ll soon appear here in the UK. I’m quite excited by the prospect of the BBC adapting Philip Pullman’s popular trilogy of books in to a series, especially after the success of last year’s Jonathan Strange & Mr Norrell. Admittedly, this may not make it on to our screens until next year, but just in case, I wanted to include it here, as I’m sure it will prove to be a wonderful series for all the family, whether a fan of the books or not. So those are the shows I’m most excited about watching in 2016 from the ones we know about this early on in the year. Who knows what else could be coming to our screens over the next 12 months! Feel free to let me know what you will be watching. I’m always looking for recommendations! Posted on January 19, 2016 January 20, 2016 Categories TelevisionTags Adrian Lester, BBC, Benedict Cumberbatch, Billions, Claire Foy, Damian Lewis, David Duchovny, Death In Paradise, Game of Thrones, Gillian Anderson, Grantchester, Happy Valley, HBO, His Dark Materials, House of Cards, Hugh Laurie, ITV, James Norton, Jenna Coleman, Kevin Spacey, Kris Marshall, Line of Duty, Matt Smith, Netflix, Of Kings & Prophets, Oliver Rix, Olivia Colman, Olly Rix, Prison Break, Sarah Lancashire, Sophie Okenedo, Television, Television 2016, Television review, The Crown, The Hollow Crown, The Night Manager, The Unbreakable Kimmy Schmidt, The X-Files, Tom Hiddleston, Undercover, VictoriaLeave a comment on My Top Television Choices for 2016! This film had been on my list of ones to watch in 2015 and I wasn’t disappointed during my last trip to this year’s London Film Festival on Friday night. It’s a compelling, absorbing, tension-filled story, which certainly isn’t for the squeamish. 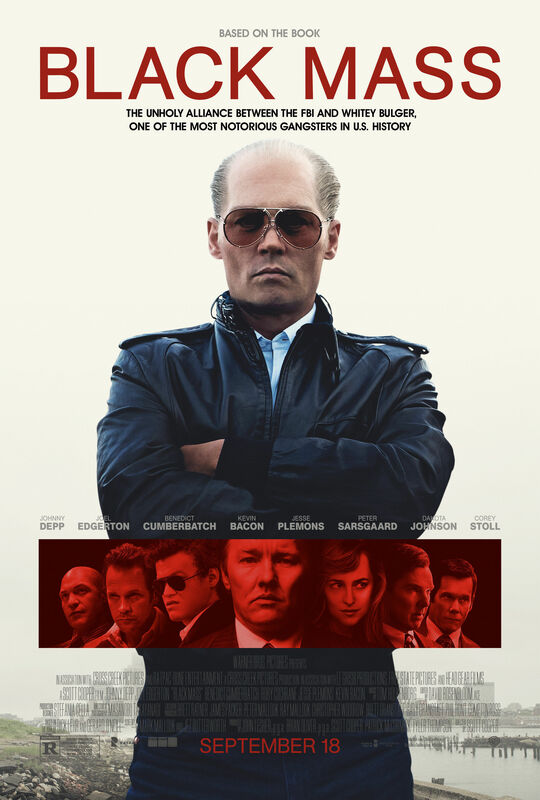 Based on the 2001 book, the film tells the story of the world of organized crime in 1970s and 1980s Boston, where the New England Mafia family, the Angiulo Brothers, controlled the north while the Irish-American gang led by James “Whitey” Bulger (Johnny Depp) resided in the south, but were growing ever more ambitious. Determined to gain some control of the situation, the FBI saw an opportunity and agreed to make a deal with Bulger, seeing him as the lesser of two evils – he would be their informant, secretly providing information to help bring down his rivals and in return they would protect him, a deal which is championed by Agent John Connolly, who grew up with the Bulgers. However, the result works much more to the benefit of Bulger rather than the FBI, as his gang grows stronger in Boston, elevating him to become a notorious gangster and effectively making him untouchable. It’s an interesting and frightening look at not only the world of violent crime in the era, but also how power corrupts, as soon the actions of Connolly and some of his colleagues become as questionable as those of the criminals they were seeking to stop. It also demonstrates how gangsters don’t just appear; Bulger’s rise wouldn’t have happened without the FBI’s actions. The script by Mark Mallouk and Jez Butterworth (the genius behind the brilliant play Jerusalem) is tight and well-paced and together with director Scott Cooper they have produced a film that keeps you engaged and gripped throughout, aided by a quality ensemble cast. The acting as a whole is very strong, which is to be expected from such a great cast. However, this is Johnny Depp’s movie. He is the central figure and commands your attention in every moment. Almost unrecognizable thanks to prosthetics; his portrayal of Whitey is utterly chilling. You are in no doubt that he is a very dangerous man and absolutely believe that he could snap at any moment (which he does frequently). The script also brilliantly allows moments where we see the kinder side of him (like all mobsters, he loves his mother, son, brother and little old ladies in his neighbourhood! ), but this only makes it more unnerving when in the next scene he is committing cold-blooded murder! It’s a superb performance from Depp, which I hope receives greater recognition in the awards nominations and without question is his best work for some time (after so much fluff in recent years). Every expression, movement, laugh and look in his eyes feels true to character and quite uncomfortable to watch. He maintains Whitey’s calm exterior perfectly, but also the sensation that he’s a coiled spring, ready to release at any moment, adding to the tension of the piece. The scene around the dinner table included in the trailer has you bracing yourself for him to erupt. 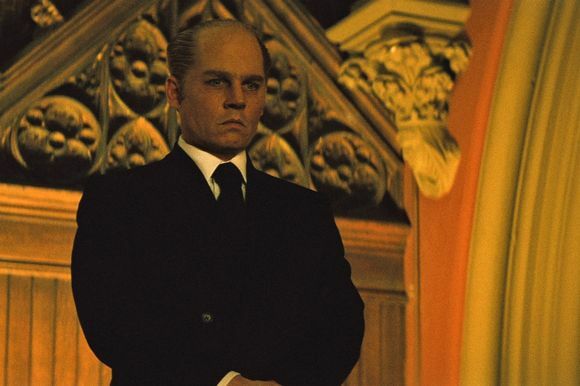 In order for the film to have a depth and weight to it, Whitey needed to feel real and frightening and Depp certainly pulls this off. There are great supporting performances all around him. W.Earl Brown as his go-to executioner Johnny Martorano and Rory Cochrane as fellow gang member Stephen Flemmi, who clearly grows more and more disturbed by Bulger’s actions, are both very well cast. Dakota Johnson also enjoys a tougher (if somewhat small) role here than in 50 Shades, playing the mother of Bulger’s young son. She’s one of the few people who seem to be able to get away with standing up to him. It also seems incredible that at the time Whitey was committing such dreadful crimes, his brother was the Massachusetts State Senator. Playing the other side of the moral coin to Depp’s crime lord is Benedict Cumberbatch as his brother Billy. Noticeably bulked up in physique for the role, Cumberbatch is a great addition to the ensemble and it’s a shame there aren’t more scenes between him and Depp that delve a little deeper in to their relationship. A man who clearly takes his job seriously, Billy is stuck trying to maintain a balance between his love for his brother and his duty to public office and the strain of this is obvious, as he is clearly aware to a certain extent of what his brother is doing. Joel Edgerton is also excellent as cocky Agent Connolly, conveying brilliantly his slide from FBI man to an extension of Bulger’s gang, turning a blind eye to Bulger’s crimes and deceiving his superiors about Bulger’s usefulness as a source in order to maintain his ascent to professional success, through his supposed results. Perhaps he really did believe in the beginning that Whitey was the answer to the FBI’s problems, but this seems hard to argue by the end, where his love of power and position, as a result of his link to Bulger, seem to mean more to him than anything else, including his marriage (Julianne Nicholson is also very good as his concerned wife Marianne, who grows ever more fearful of Whitey’s effect on her husband). 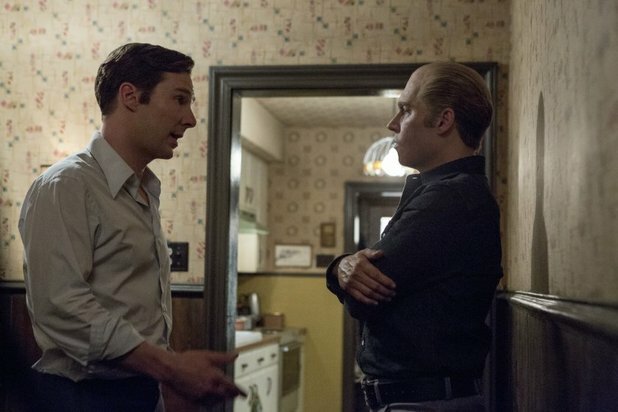 Black Mass is a gripping crime drama, which is all the more interesting due to being based on real events. With a strong script brought to the screen by a excellent ensemble, I highly recommend it. 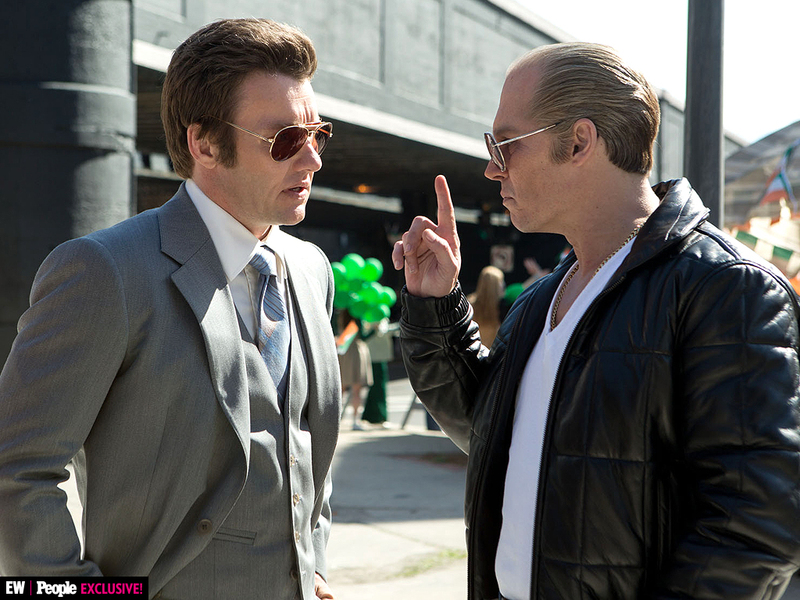 Black Mass is on general release in the UK from 27th November 2015. For those yet to see it, click here for the trailer. Wednesday night was the BFI London Film Festival’s programme launch for members, which proved to be an insightful look at the eclectic mix of films being showcased this October. The festival this year sees 238 films, from 57 countries being screened across London (there are 16 participating venues this year) from 7th – 18th October. Festival director Clare Stewart declared that 2015 is the year of strong women and that the festival showcases this through not only films about the strength of women, but also by having 20% of directors represented being women (admittedly not a huge number, but Stewart noted that this was better than other festivals). It was an interesting evening, during which we saw a number of trailers and clips from some of this year’s films, across the variety of festival strands (Gala, Competition, Love, Debate, Dare, Laugh, Thrill, Cult, Journey, Sonic, Family, Treasures and Experimenta) and I found this particularly interesting for the smaller budget and foreign language films, areas I admit I am quite unfamiliar with. With so many films across the strands (including a new short film award this year), there will be something for everyone and I urge you to have a look through the extensive festival brochure. Here though are the top 20 that I’m looking forward to seeing, whether I manage it during the festival or on general release later on. No film at the event encompasses strong women more than the film which opens this year’s festival. 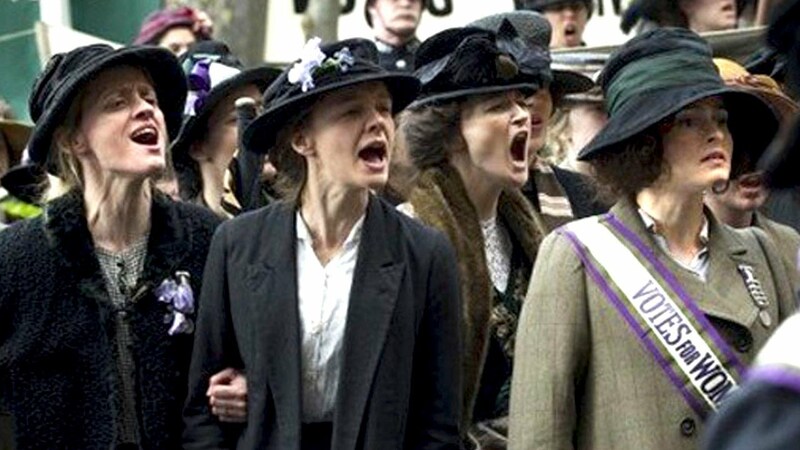 Suffragette sees an impressive cast including Carey Mulligan, Meryl Streep, Anne-Marie Duff, Helena Bonham-Carter and Ben Whishaw bring the history of the fight of women for the vote in the early twentieth century. 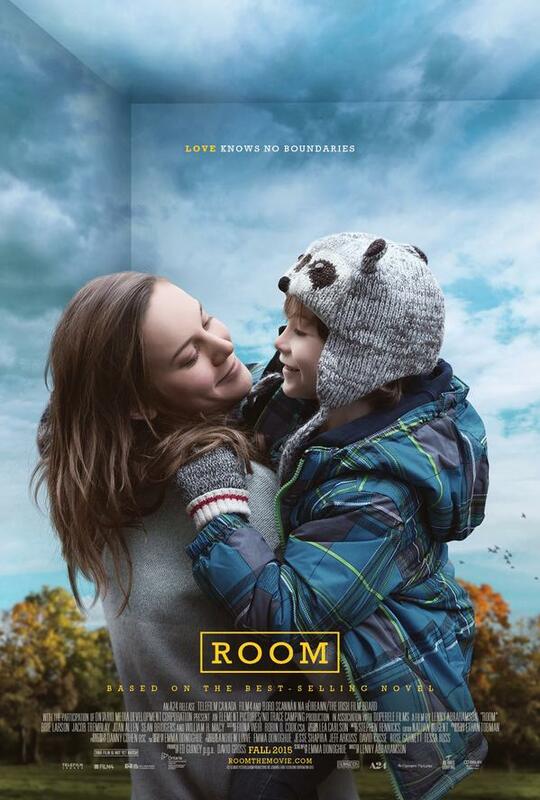 The trailer certainly looks great and Carey Mulligan could be seeing awards nominations in her future. The opening night’s screening will also be screened in select national cinemas, details of which are on the LFF website. 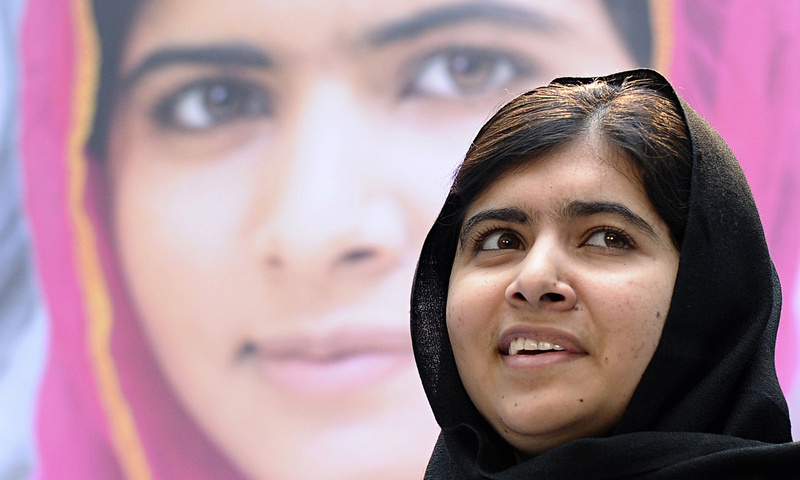 Another inclusion showcasing powerful women is this documentary about one of the most famous and incredible young women of our time – 17 year-old Malala Yousafzai, who after being shot in the head by the Taliban for championing girls’ education has gone on to win the Nobel Peace Prize and continue to be a role model around the world. Director [Davis] Guggenheim’s film looks to be an incredibly interesting record of her life so far. 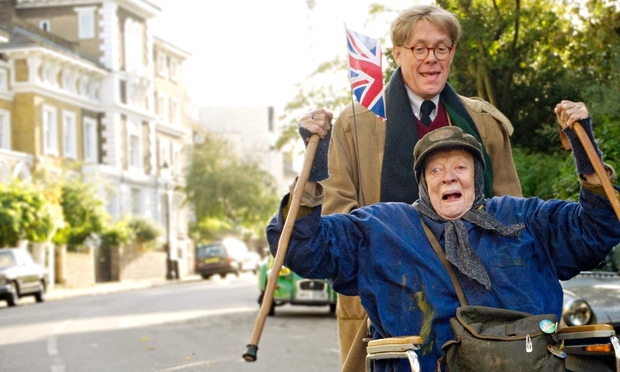 Anything with Dame Maggie Smith gets my vote and this adaptation of Alan Bennett’s play (which she also starred in), based on the true story of the woman who parked her camper van on his drive and ended up remaining there for 15 years, looks wonderful. As well as Maggie Smith, Alex Jennings plays Bennett and as someone who has seen him in the role on stage, it’s sure to be a wonderful portrayal. Funny and touching, this looks to be a British gem. Another topical inclusion is director Stephen Frears’s (previously at the festival with Philomena) The Program, which tells the story of Lance Armstrong’s fall from sporting icon to disgrace. Chris O’Dowd is the sports journalist David Walsh, who was determined to prove Armstrong’s cheating was a reality, while Ben Foster (looking vastly different from when I last saw him on stage in A Streetcar Named Desire) plays Armstrong. It looks both interesting and engaging, with some fantastic work capturing the power and energy of the sport. 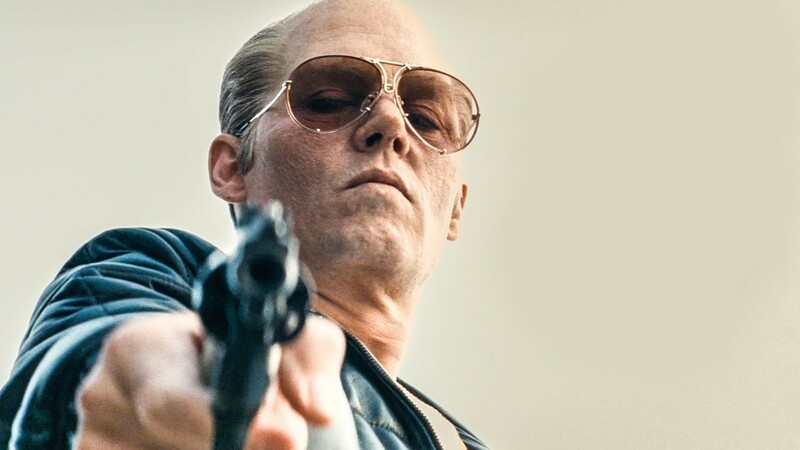 I couldn’t fail to mention Black Mass, which sees Johnny Depp transformed in to the creepy Jimmy “Whitey” Bulger, an infamous real life Irish gangster in Boston, who became an FBI informant to help them eliminate the Italian mob. With support from Benedict Cumberbatch as his brother, a political rising star and a screenplay written in part by Jez Butterworth (the man behind the incredible play Jerusalem), this looks to be a tense crime drama, giving Depp something a bit meatier to get his teeth in to. From the reviews coming out of Venice today, it sounds very promising indeed. One from the “Laugh” strand of the festival which has caught my eye is this film starring Jack Farthing, Joe Dempsie, Laura Carmichael and Chloe Pirrie, in which Dan (Farthing) who has recently passed away gives his friends the final task of scattering his ashes in five disparate places around the country. Along the way he’ll accompany them via the video messages he has recorded, which from the trailer bring both laughter and poignancy. I love a good film about the power and importance of friendship, so I’ll certainly put this on my list. 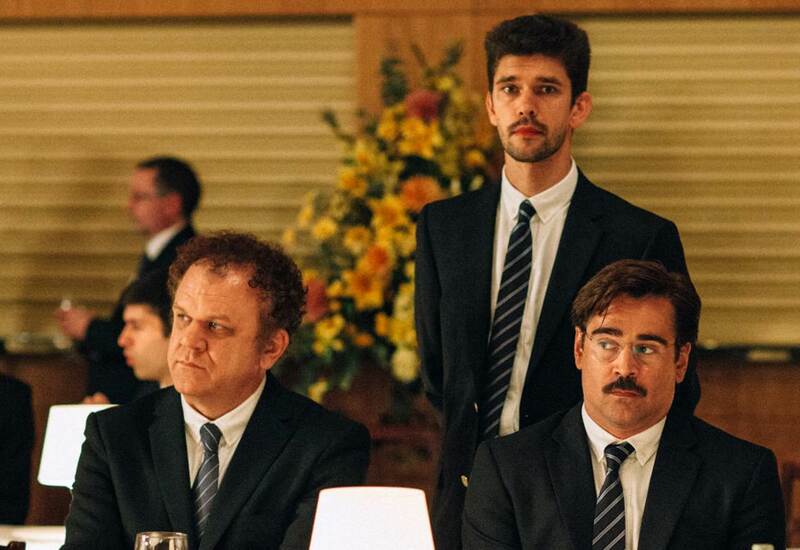 A quirky addition to the Gala strand is this film by Yorgos Lanthimos with an all-star cast of Colin Farrell, Rachel Weisz, Ben Whishaw and John C. Reilly. Set in the near future, singledom is banned and those not paired up must go to The Hotel, where they have 45 days to find a mate. If not, they are transformed in to an animal of their choice (hence the title, the choice of Farrell’s character). It sounds bonkers (and the clip shown was indeed bizarre), but I’m intrigued by the possibility of mixing surreal humour and love with something that bit darker in tone. Plus anything with Mr. Whishaw cannot be missed in my opinion! I have been aware of the novel Room since it was released in 2010 but have yet to read it. Therefore this adaptation by Emma Donoghue of her own bestseller caught my eye in the brochure. The idea of a five year-old child spending their life since birth in an 11 foot room with just their mother (and the possible reasons as to why they remain there) sounds horrifying to me, even though little Jack does not have any awareness of the world outside his own. The story of this mother-son relationship, is one I expect to be incredibly powerful and will try to see. I had never heard of this film before the event this week, but it certainly intrigues me. Adapted from Taiwanese actress Sylvia Chang’s play Design For Living, this Hong Kong film charts the corporate culture and glamourous lives of those working in the office in question in stylish, musical song and dance fashion, with a cast that includes Sylvia Chang herself. It sounds quite surreal, but I loved how the play Enron brought something fresh, inventive and creative to the story of corporate greed in today’s world and perhaps this Chines film could be equally as entertaining. I’ll be interested to see what the reaction to it is at the Toronto Film Festival later this month. Cate Blanchett stars in two films at this year’s festival (the other being Carol), while also receiving the BFI Fellowship. 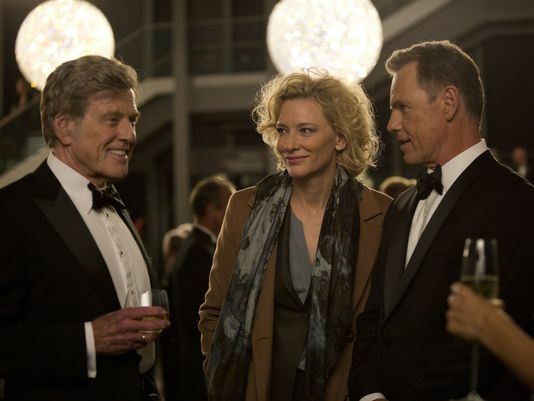 Both movies look fantastic, but I’m more interested in seeing Truth, in which she plays Mary Mapes, producer of Dan Rather’s 60 minutes television show in America. The film focusses on the programme’s questioning of George W. Bush’s avoidance of the Vietnam draft and whether he received preferential treatment. With Robert Redford as Rather and also starring Elisabeth Moss, I’m hoping this proves to be an engaging and intelligent political drama. Nick Hornby adapts Colm Toibin’s best-selling novel, in which a young Irish immigrant in 1950s Brooklyn (the wonderful Saoirse Ronan) faces the pain of choice – between her Irish homeland and a new life in America, as well as between two men from those different places. She’s a fantastic talent and with a brilliant cast including Jim Broadbent and Julie Walters (who looks fab as her Brooklyn landlady from the clip we saw on Wednesday night), I’m hoping this will be a stirring and moving film. For fans of the TV show Arrow, I think I also spotted Emily Bett Rickards (Felicity Smoak) in the cast too, although I’ve no idea how big her role is. Closing the festival (so almost certainly one I’ll have to watch on general release) is this film charting the life and success of a hugely iconic figure in today’s society – Steve Jobs. 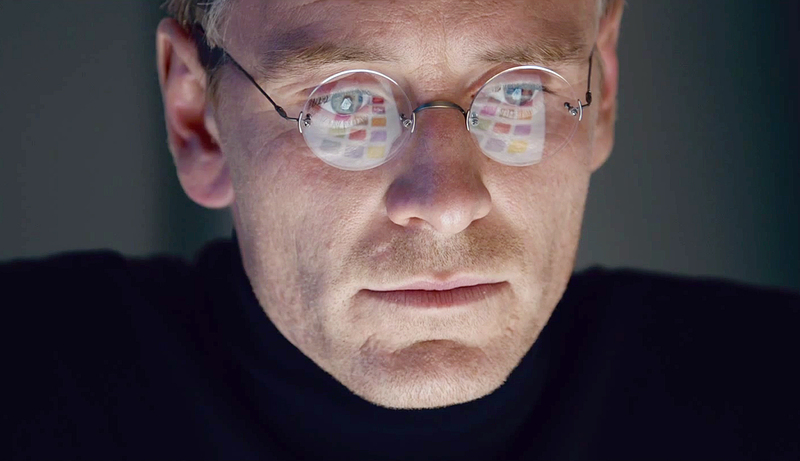 With direction from Danny Boyle, a screenplay by Aaron “West Wing” Sorkin and the hugely talented Michael Fassbender in the title role (together with support from Kate Winslet), I have high hopes for this movie and the trailer looks great too. 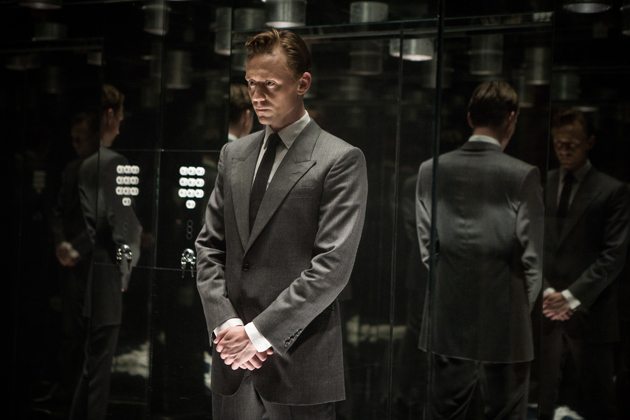 An adaptation of JG Ballard’s 1975 novel, this film is according to the BFI’s festival brochure said to be a “brilliant satire of both 1960s social idealism and the Thatcherite values that undermined it.” Starring Tom Hiddleston as Dr. Robert Laing, the film is set in a luxury high rise tower, in which everyone who lives there is cut off from the rest of society. No trailer has yet been released, but from the clip we were shown (which saw Hiddleston shopping on the supermarket level and seeing a glamorous woman pass with her huge dog in her shopping trolley) this looks to be a surreal, but interesting film. The supporting cast includes Jeremy Irons, Elisabeth Moss, Sienna Miller and James Purefoy. 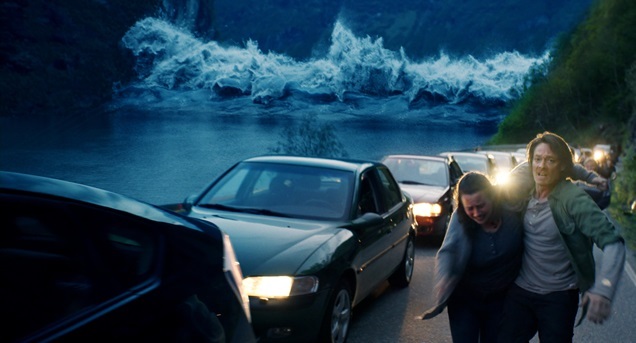 For fans of disaster thrill rides and Nordic/Scandi dramas, look no further than The Wave. Set in Norway, the film envisages what would happen today if a landfall in the fjords triggered a tsunami (as happened once before in 1934). It may scare me to death, but the visual effects looked impressive enough for me to give this a try. Plus the film has just been announced as Norway’s entrant for consideration for Foreign Language Film at next year’s Oscars. 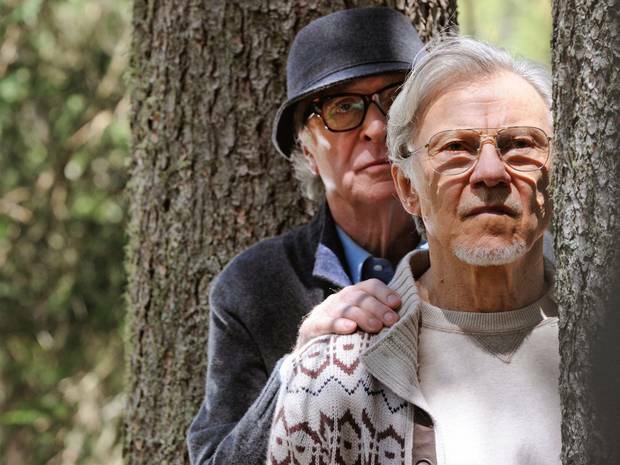 This film by Italian writer and director Paolo Sorrentino, set largely in a luxury Swiss spa, stars Michael Caine as Fred, a retired composer and Harvey Keitel as Mick, an elderly film director looking for a comeback and centres around their friendship, while weaving various strands of narrative together. I don’t know too much about it yet, other than it stars Rachel Weisz as Fred’s daughter and Jane Fonda, but I love Michael Caine’s work and I’m hoping this will be a moving and funny addition to the festival. It has already competed for the Palme d’Or at this year’s Cannes Film Festival and will also be shown during this month’s Toronto Film Festival. This Netflix original film is currently receiving a positive response at the Venice Film Festival. 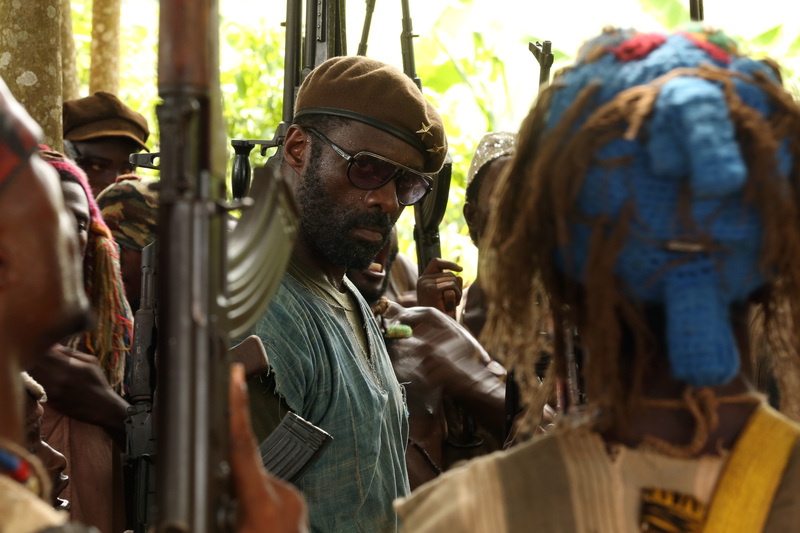 By Carey Fukunaga’s (HBO’s True Detective) it is an exploration of child exploitation in an Africa country torn apart by civil unrest and atrocity stars the brilliant Idris Elba as The Commandant of a militia of rebel soldiers and newcomer Abraham Attah as the young boy Agu. I certainly don’t expect this to be an easy film to watch, but I’m sure it will prove to be extremely powerful and will see release globally on Netflix in October. Lily Tomlin stars as a foul-mothed poet, who ends up on a road trip through LA with her 18 year-old granddaughter after the death of her long term partner and her split from her recent much younger girlfriend. This film sounds extremely enjoyable and as Lily Tomlin is always a joy to watch (although she’ll always be The West Wing’s Deborah Fiderer to me!) I’m hoping for a few laughs and some cracking, sharp dialogue with this one. From watching the trailer I don’t think I’m going to be disappointed. 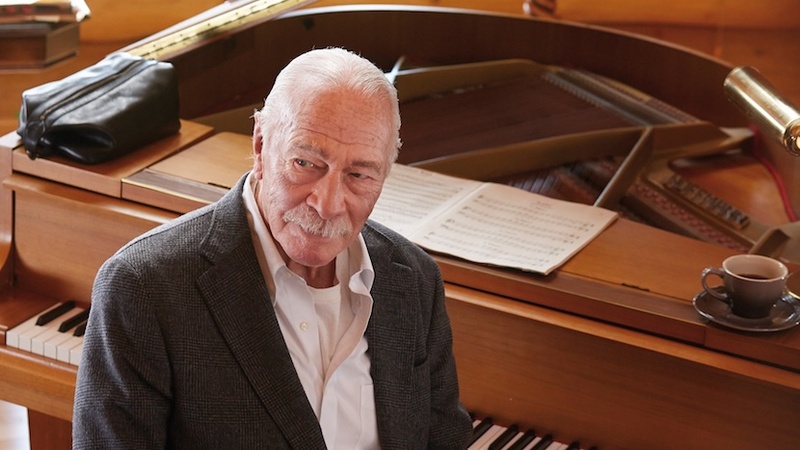 This drama starring Christopher Plummer, looks at the nature of evil, with Plummer as an elderly German Jew, already succumbing to Alzheimer’s, determined to keep the promise he made to a friend (played by Martin Landau) to find and kill the Nazi commandant who ordered the deaths of both their families. With such a great actor as Plummer and dealing with a subject that still sparks powerful, emotional reactions, I’m going to try and see this one. One from the archives here, as the festival screens this recently discovered American silent film from 1916. Once thought lost, it is based on the popular 1899 play by William Gillette of the same name and also stars Gillette in the title role. Its significant to the Holmes world, as Gillette is viewed as contributing greatly to our image of Holmes and to the development of the character of Moriarty. 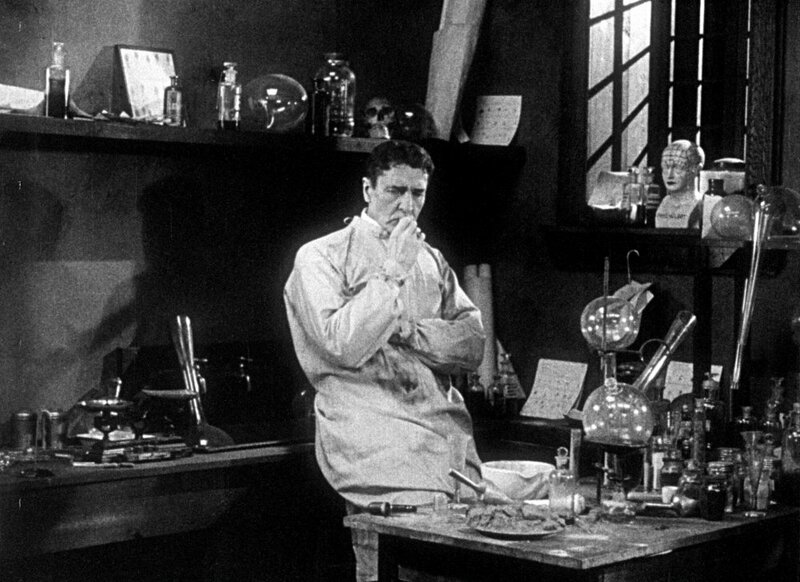 This will no doubt appeal to fans of the famous detective from 221B Baker Street and it’s wonderful that such films are still being discovered and restored for the pleasure of a whole new audience. One for the family here with the big screen arrival of the hugely successful book series by R L Stein that every generation of kids seems to know. Starring Jack Black, this film looks set to be a thrilling and entertaining outing for children and perhaps adults looking to relive a part of their childhoods. So those are my picks from the extensive offerings at this year’s festival. As you can see it’s a varied mix and I’ve barely touched so many of the strands. If you enjoy cinema, are looking to see an upcoming film a little earlier or are curious to delve in to some foreign films, then download the brochure (or pick up a hard copy) and start planning your festival schedule! 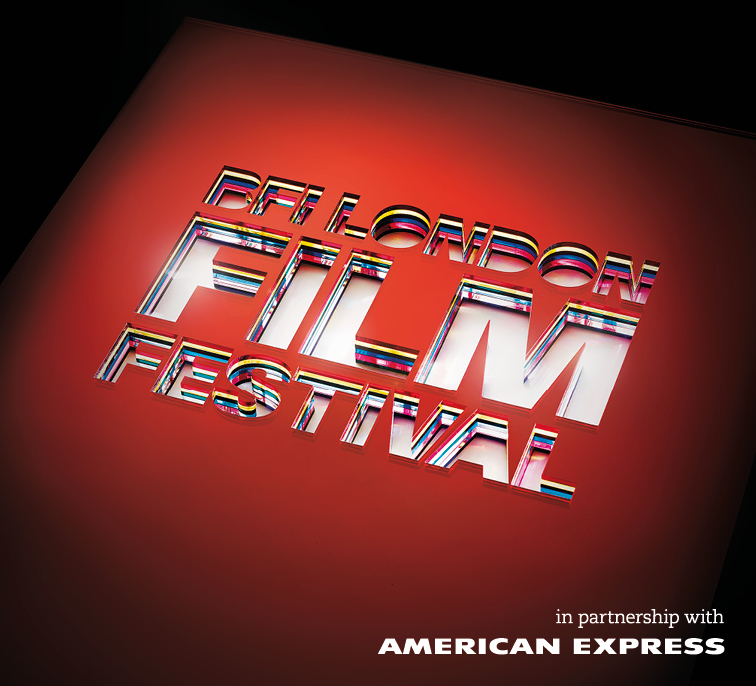 The BFI London Film Festival runs from 7th – 18th October 2015. For full details about the programme visit the festival’s main website. Public booking opens on 17th September or you can consider becoming a member of the BFI. Saturday night saw me return to the Barbican for my third visit to Hamlet and the first since press night. After seeing the very first performance, a preview in week two and now the show three weeks in, it’s interesting to see what’s changed and what hasn’t. I was relieved that overall the show was much stronger, mainly in terms of the supporting performances. 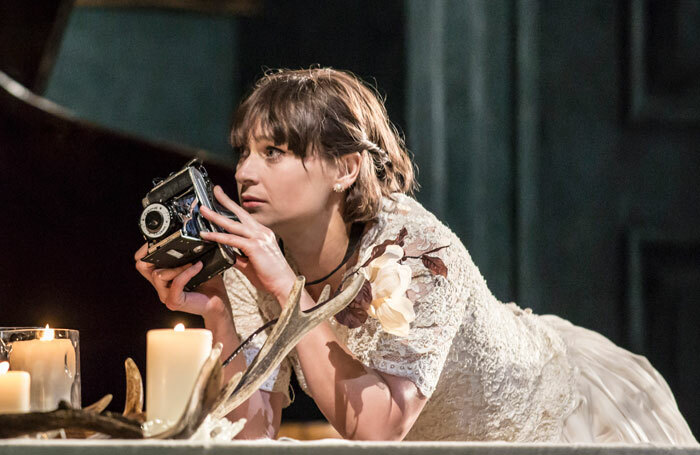 Sian Brooke’s Ophelia has grown in her role over the previews. 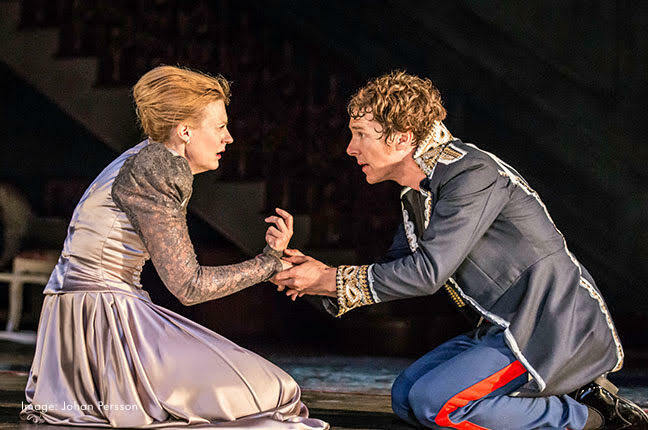 I still don’t feel that there is a significant connection between her and Hamlet, but what I truly love about her portrayal is she’s not a mad whirling girl, but someone who becomes so broken by grief and loss. This is much more believable in my view, as we all suffer losses of varying degrees in our lives and it is more much relatable than someone dancing around manically. The use of snatched dialogue she has heard or overheard earlier during her “mad” scene is very clever and shows how those around her have been the cause of her emotional breakdown; the mock funeral she stages is very sad and truly brings home the tragedy of her situation and her final moments on stage remain the most moving and powerful of the show. The piano, the photographs and camera, the gorgeous use of light and Jon Hopkins’ Abandon Window music add to the impact and the moment she leaves the stage is visually beautiful. Anastasia Hille is much improved as Gertrude, bringing more substance to her presence on stage and to her relationship with her son. Thankfully the closet scene is stronger than it was in early previews. Again she excels in later scenes and the touch of her running after Ophelia is something I loved, as is the added detail of her dress (sleeves and bottom half) being clearly wet when she returns with news of her death. I always wonder about Gertrude’s presence at Ophelia’s death from her speech and what she did. Here you can at least believe she went in to the water herself to reach Ophelia. Unfortunately there is however still no chemistry between her and Ciaran Hinds’s Claudius. By the end she has shifted away from him, but for this to have more weight, you need to have seen a disintegration of their relationship. In this production there is never any real connection to begin with. Kobna Holdbrook-Smith remains the strongest ensemble actor here. He projects his voice to the whole audience and successfully conveys Laertes’ affectionate, caring relationship with his sister (their moment at the piano is tender and warm) as well as his potential for anger on returning to avenge his father’s death. It’s a shame he isn’t on stage more or have more scenes with Benedict. Leo Bill is now a much better Horatio, but I think the weaknesses that still remain are due to the directorial choices. With the removal of the opening scenes we lose time with the character and due to the staging choices he is often so far to the side you forget he is there (for example, the play scene). For me, he should be more visible. Yes he is an outsider, but he is the loyal friend who should be seen to be by Hamlet’s side. Other productions have done this very effectively – the peak remaining Peter De Jersey for the RSC. I do however enjoy the choice to give him Getrude’s final line – in this production it is Horatio, ever the observer who announces that the Queen has been poisoned. Jim Norton has improved as Polonius, although would such a wise man need to write his words of advice to Laertes down? 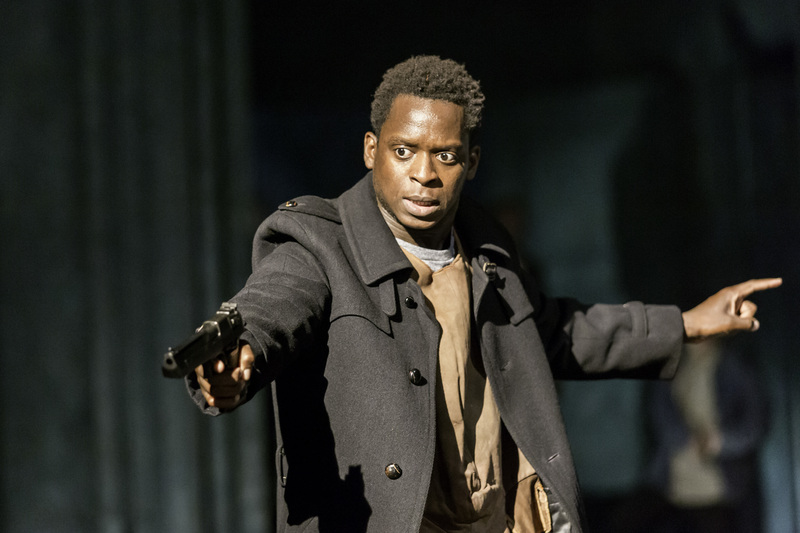 Thankfully his death is also much better than the clumsy staging of early shows, but he still remains a bit dull, which is a shame when Oliver Ford Davies has shown how lively a character he can become. Matthew Steer and Rudi Dharmalingam are still sadly lacking as Rosencrantz and Guildenstern. They may be small parts, but I’ve seen actors bring them to life much more effectively. They seem totally irrelevant here and I can never picture this Hamlet having ever been friends with them. They aren’t assisted by the ridiculous decision to stage their arrival on the side balcony, which is only visible to part of the audience! 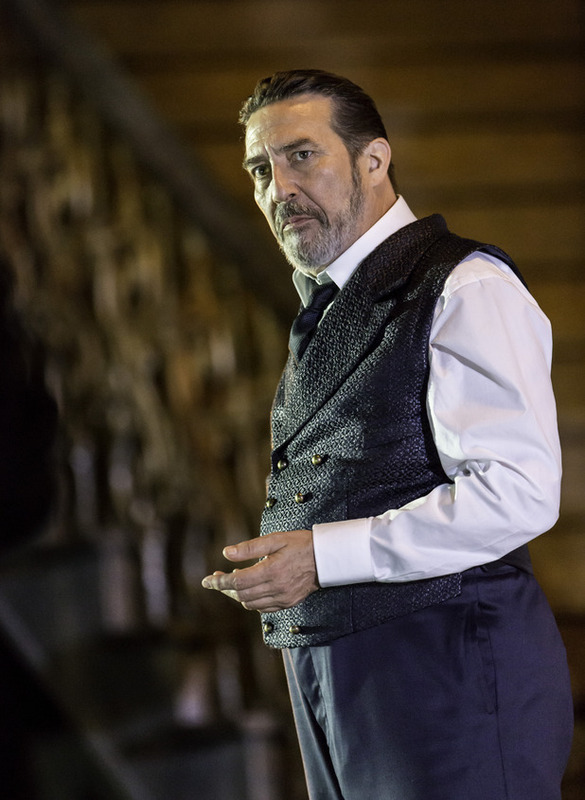 However, despite the improvements in performances, the biggest disappointment remains Ciaran Hinds’s Claudius. First and foremost his voice projection is still weak. You struggle to hear him in certain areas of the theatre. It may be a big space but I’ve never experienced actors struggling to make themselves audible at the Barbican before this production and I did note mics on some actors. His Claudius is also on the cowardly end of the spectrum. I’ve seen drunken, lecherous ones (John Nettles in Sheffield) through to subtle, menacing statesmen (Patrick Stewart) and I find the cowardly interpretation frustrating. This is after all a man who has killed his own brother and is running a country and planning military strategy. Having him cower on the floor before Laertes feels wrong to me. I did however appreciate the switching of lines between him and Gertrude at this moment. In the text it is Gertrude trying to protect him by telling Laertes he did not kill his father. In this production, it makes perfect sense that such a cowardly Claudius would say that line himself in fear while cowering on the floor. Claudius isn’t an obvious villain from the outset, but if you don’t believe his potential to be a dangerous operative, then he simply becomes a bit dull and boring and of no threat to Hamlet at all and Ciaran Hinds did rather bore me. The final scene before the interval is visually and audibly striking, but I don’t believe that the man at its centre carries any real threat, meaning it just isn’t very satisfying in my view. In terms of the production’s staging and direction, there are aspects I enjoyed and that work well. The first reveal of the opulent banquet is still incredibly impressive and truly shows off the length and depth of the Barbican stage. It’s literally as if you’ve stepped in to a painting which is wonderful. The music by Jon Hopkins is wonderfully atmospheric, as is the lightning design. I also like the comedic touches of Hamlet within his fort, as if a child once again. It’s also much better that the projected visuals that used to appear in every doorway, whenever the Ghost appeared have been greatly reduced, as they were quite distracting and unnecessary. The way the Ghost appears during the closet scene is also wonderfully eerie and gothic in style, which I liked very much. The nunnery scene also has some added touches that work well. I’m still curious what Ophelia is writing frantically, as if she is trying to warn Hamlet, then it’s clear from Benedict’s performance of the scene that he senses that Claudius or someone working for him is listening. However I do have some not insignificant grumbles. The positioning of the balcony is ill-conceived, as it is not able to be seen by those sitting on the left side of the auditorium – I’d guess at least the first 4-5 seats of each row have a restricted view for the scenes that take place there, including Hamlet’s reaction on first seeing his father’s Ghost and his consideration of killing Claudius seemingly at prayer (and charging over £60 for such seats is very poor indeed). With such a vast space, this balcony could surely have been moved. The set is also too busy at times. The banquet scene results in the frustration of seeing servants carrying chairs and flowers etc. off stage as Laertes and Ophelia have their moment together (crucial to weight their affection in preparation for the tragedies to come). The rushing on of desks and office furniture as Ophelia also comes across Hamlet trying on his outfits is also distracting. This moment between the two is one of the few opportunities to try and make a connection between them and yet it is lost amongst the needless moving on of furniture. These courtiers may wear the same coloured suits as the walls but they are still a distraction at times when the focus should be on the play, not on the visuals. The addition of instruments filled with flowers during the play scene are perhaps the most pointless. They are brought on and then simply carried off again, serving no real purpose. With a play whose text is as rich as Hamlet’s such things stood out as style over substance for me. As for Benedict himself, he is certainly settling in to the role and growing as time moves on. 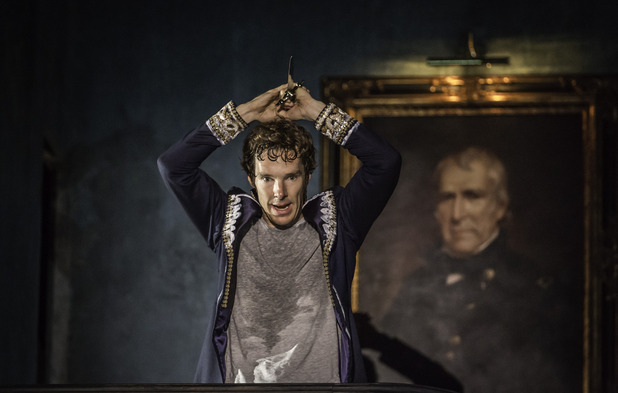 Hamlet’s soliloquies are now flowing from him naturally, as if from the character rather than an actor on stage. His passion and energy are also much stronger and he seems to dart around the stage with far more confidence and ease, which can only continue to benefit his performance. His opening soliloquy is the right pitch of anger, sorrow and despair as the gothic slo-mo banquet carries on behind him and I still love his “What a piece of work is a man?” delivered outside his toy fort with a very real depth of feeling. 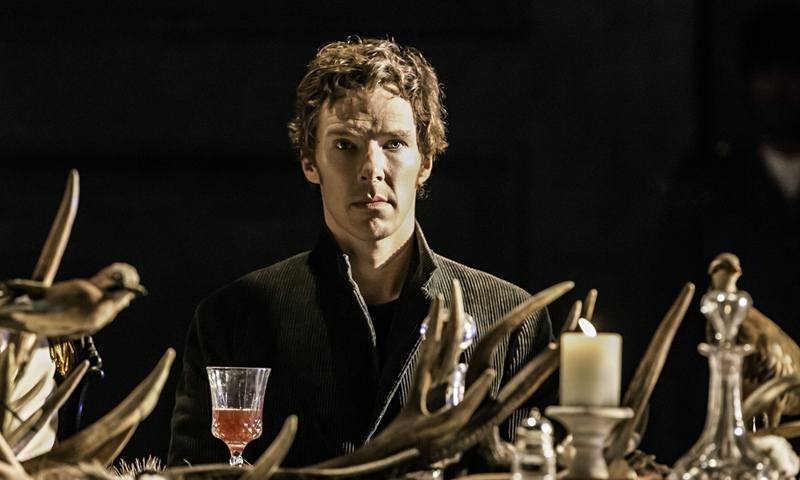 Again, as with Horatio, some of my grumbles are more staging points than acting ones – I’m still not sure I like the use of Hamlet within the play scene. The focus should be on Claudius and his reactions and Hamlet’s reaction to him. By Hamlet taking part, you find yourself shifting attention to him. I also miss some of Shakespeare’s wonderful dialogue that has been cut (such as “miching mallecho; it means mischief”). As for the ridiculous fuss over To Be or Not To Be, as one of the small number who saw it in its initial place up front – I quite liked it. It made the production interesting and did give you immediate sympathy for Hamlet. Watching him listen to Nature Boy and curl up on his side and cry for his father certainly made you sit up and pay attention, which I personally enjoyed. Hamlet is over 400 years old and experimenting with its form is what helps keep it current and exciting. Now it’s moved to Act II (so still not its normal place, yet I see no big grumbling about that) and works perfectly well here too, thanks to the calibre of the actor. He moves from farcical comic with Polonius to someone grappling with darker emotions swiftly and convincingly and as he walks off afterwards, you do indeed feel the power of that iconic text. 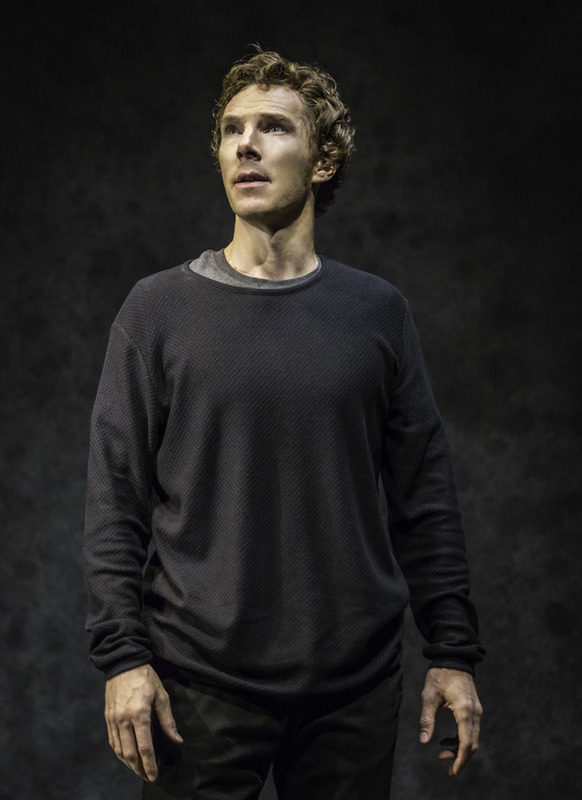 As was the case three weeks ago, this production is still very much Benedict’s show. Although the supporting cast have improved, they do remain in his shadow and the production would have been so much stronger if he was more equally matched by more of the ensemble around him. This isn’t a superb production, but it is certainly much better than it was and is a worthy one to introduce newcomers to Shakespeare, through the strength of its leading man in particular. 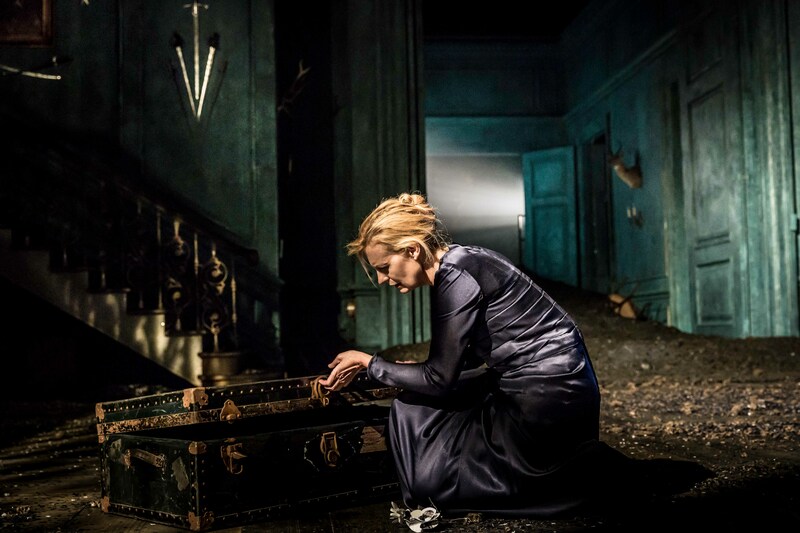 Hamlet continues its run at the Barbican Theatre until 31st October 2015. For further information visit the website. For details of the NT:Live cinema screenings across the country and internationally visit the NT:Live website.